Police wish to speak to this person in connection with the incident. Police have released CCTV stills following a taxi journey that was left unpaid for. 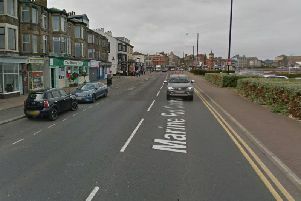 At around 3am on August 20, two men and a woman got a taxi from McDonald’s in Lancaster, being dropped off at around 3.20am in Sefton Road, Morecambe. Police want to speak to this woman in connection with failing to pay a taxi fare. Along the route the taxi stopped at two petrol stations. Having paid a very small portion of the fare, the people then got out of the taxi in Sefton Road, but did not return to the taxi to pay the rest of the outstanding fare. One of the people was described as a white man, about 6ft 3ins tall, thin build, short brown hair and prominent ears, wearing a pale coloured shirt. The woman was described as white, with bleach blonde hair in a centre parting and about 5ft 6 ins tall, medium build and wearing a black and white cardigan shawl over a black t-shirt. The second man was also white, about 5ft 6ins tall and of medium build. He had medium length unkempt brown hair and wore a black bomber jacket over a black t-shirt and had a black backpack. CCTV of one of the men who has just been released following the incident. PC Caroline Caine, from Lancaster and Morecambe police, said: “We would ask the public to study the image released and I would urge anybody that recognises the man or any of the descriptions given of the individuals to get in contact with us. Anybody with any information can call police on 101 quoting crime number WB1506788 or Crimestoppers anonymously on 0800 555 111 or online at Crimestoppers-uk.org.